pique a boo: I Fought The "Law..."
I'm bursting with stuff to blog. But I've been busy and I wanted everyone to have a chance to see my hair. This week I plan to update every other day, so keep pique a boo in mind. First up, Flight 1248. 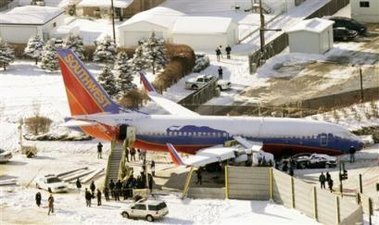 On Thursday, December 8th, Southwest Airlines Flight 1248 from Baltimore to Las Vegas (with a stop in Chicago) slid off the runway at Chicago Midway Airport. This happened around 6 pacific time. As a news producer, it became up to me to decide how I wanted to treat this story in my show, which goes on at 9. Since I already had one package (longer formatted story) in the show about snow, and the plane slid in snowy weather, I planned to put them together near weather. Granted, that mentality worked much better in Fargo, where weather is more newsworthy than it is here. Anyway, my anchor said something like "So I guess this is our new lead." And he was serious, he wanted to start the show with a story about a plane sliding in the snow. At the time, there were no injuries being reported. It was just a plane, that slid. Now I know that doesn't happen everyday, but it's certainly not the biggest thing that happened. Newsworthy for certain, but the most important story of the day? I would say not. I argued my piece but told my anchor I'd concede to lead with it. Then they found the car underneath the wing, and the child died. It's terrible news, but just the sort of thing that leads a newscast. On Friday, I was over it. Even though there were Las Vegans on the plane, none of them were hurt. And none of them even knew anything had happened until they got off the plane. On Friday, nothing was new. 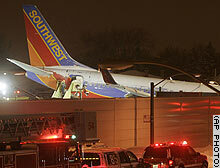 It was still a plane that slid in the snow, hit a car, and killed a child. I was content to keep it in the first block, but not lead with it. Well I told him quite a bit. We went back and forth a lot. Here are my reasons for not wanting to lead with it. Anyone local on that plane has already contacted their family members. It could not happen here (we did a whole story explaining why) . It was more than 24 hours old. The real tragedy happened to the people in the car, and none of our local coverage even mentioned that family. National media have this habit of creating the big stories, instead of just reporting them and I want no part of that. I thought there were more important things happening locally. My anchor (who shall remain nameless because we are not friends) said he'd let me make the call. So I made it, and built the show without leading with it. My anchor, it turns out, is a flippin' liar. I got an email from the nightside manager questioning my lead. The nightside manager, I'll have you know, never takes his time to look over my rundown. He and I went back and forth too. I gave him all the same reasons I gave my anchor. And then I got tired of arguing. I told him he'd have to order me to do it. He said he'd rather give me a compelling argument. Too bad his was full of holes. I told him he'd have to order me. He didn't. I lead with another story. And I felt good about it.